Playdead make puzzle platformers with somber storytelling and atmospheric visuals. It’s been close to two years since Inside released – just about enough time to start wondering what’s next from the studio. Today they’ve offered a tiny new tease of what’s next. Inside maintains a well-deserved spot on our list of the best indie games on PC. 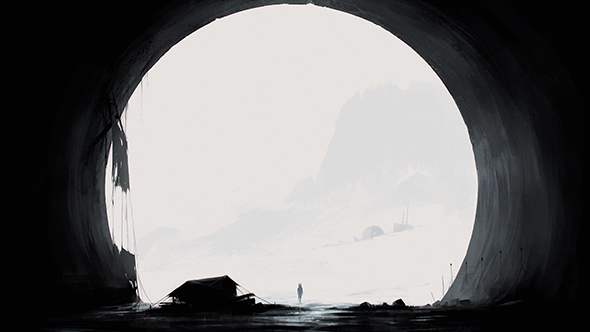 A new piece of art on their Twitter account shows a lone figure at the mouth of a massive tunnel, stepping out into the snowy hills at the foot of a mountain. Inside the tunnel is what looks to be a camp, while outside there looks to be the remains of another building. The image has some similarities to one shown over a year ago, with another figure in some sort of environment suit climbing a snowy mountain. The image comes along with the message that Playdead are seeking people who are “creative, passionate and looking for a new challenge” at GDC this year. The Game Developers Conference begins March 19 this year, and as always serves as a place for developers to discuss new titles and recruit new game makers. This is no confirmation of the next Playdead game, and no guarantee that this concept would make it into a final project – but they’re obviously working on something, and they’ve been exploring similar ideas for at least a year. Until we get details on what that new game is, you might want to console yourself with a sure-to-be horrifying Inside Collector’s Edition.